For the Chuck Berry song, see Maybellene. For the Babyshambles song, see Sequel to the Prequel. The Maybelline Company was created by a 19-year-old entrepreneur named Thomas Lyle Williams in 1915. Williams noticed his older sister Mabel applying a mixture of Vaseline and coal dust to her eyelashes to give them a darker, fuller look. He adapted it with a chemistry set and produced a product sold locally called Lash-Brow-Ine. Williams renamed his eye beautifier Maybelline in her honor. In 1917, the company produced Maybelline Cake Mascara, "the first modern eye cosmetic for everyday use," and Ultra Lash, the first mass-market automatic, in the 1960’s. In 1967, the company was sold by Williams to Plough Inc. (now Schering-Plough) in Memphis, Tennessee. The entire cosmetic production facility was moved from Chicago to Memphis over one weekend. In 1975, the company moved to Little Rock, Arkansas, where it is still located. In 1990, Schering-Plough sold Maybelline to a New York investment firm, Wasserstein Perella & Co. Maybelline’s headquarters remained in Memphis until its acquisition by L'Oréal in 1996. Its headquarters was then moved to New York City in 1996 and its factory to Brooklyn in 2000. Maybelline received a boost when the company hired Lynda Carter as the company's beauty fashion coordinator after her television series ended; she also appeared in several of its television and print advertisements. Josie Maran, Miranda Kerr, Sarah Michelle Gellar, Melina Kanakaredes, Zhang Ziyi, Siti Nurhaliza, Fasha Sandha, Sheetal Mallar, Julia Stegner, Jessica White and Kristin Davis have endorsed Maybelline products. The current faces of Maybelline are Adriana Lima, Christy Turlington, Kemp Muhl, Emily DiDonato, Beatriz Shantal, Jourdan Dunn, Gigi Hadid Liza Soberano and Urassaya Sperbund. In 1991, the company adopted its advertising slogan “(Maybe she's born with it.) Maybe it's Maybelline.” which is still used today. There is reasonable evidence that Maybelline products were tested on animals. In 1989, L’Oréal ceased to use animal testing in finished products prior to launch and committed to developing alternative methods. According to a 2010 report, though, it is required by law in some countries to use animal testing. In January 2019, Maybelline collaborated with the German fashion brand Puma for its limited edition collection that was marketed as Maybelline X Puma. It was claimed as the multi-taking athleisure-inspired collection and consisted of 5 products. Adriana Lima was chosen as the ambassador for the collaboration. ^ Bazilian, Emma (30 March 2015). "Millennial Models Like Gigi Hadid, Fueled by Social, Are Hitting the Fashion Stratosphere". AdWeek. Retrieved 1 January 2017. Leonardo Chavez, Maybelline's global brand president. ^ "Company Overview of Maybelline LLC". BusinessWeek. Archived from the original on October 16, 2014. Retrieved October 16, 2014. ^ "Cosmetics and Skin Maybelline". Cosmetics and skin. Retrieved 8 February 2013. ^ Maybelline Contracts SS12. models.com. Retrieved 2012-07-19. ^ Sciarretto, Amy. "Maybelline Just Made A Makeup Line With Puma That Will Keep Up With Your Grind". Bustle. Retrieved 2019-04-02. ^ Nast, Condé. "The Puma x Maybelline Collection Makes Me Want to Wear Dark Lipstick to the Gym". Allure. Retrieved 2019-04-02. ^ Nast, Condé. "This Is What a Supermodel Keeps in Her Gym Bag". Glamour. Retrieved 2019-04-02. 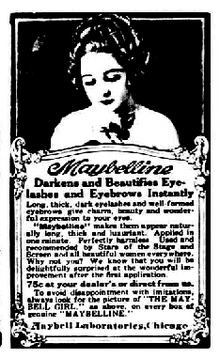 Wikimedia Commons has media related to Maybelline.